Bring contemporary comfort to the table with Sunpan’s Miller Dining Chair, available in your choice of expertly upholstered neutral fabric hues to mix or match. Featuring a clean-lined base of gleaming stainless steel, the Miller Dining Chair by Sunpan is generously cushioned for maximum comfort. Elegant yet understated, luxurious yet low-key, Sunpan’s Miller Dining Chair incorporates with ease into many modern aesthetics. Part of the 5West collection. Textured fabric with piping detail gives the chair a luxurious look and feel. Stainless steel base is both dazzling and supportive. 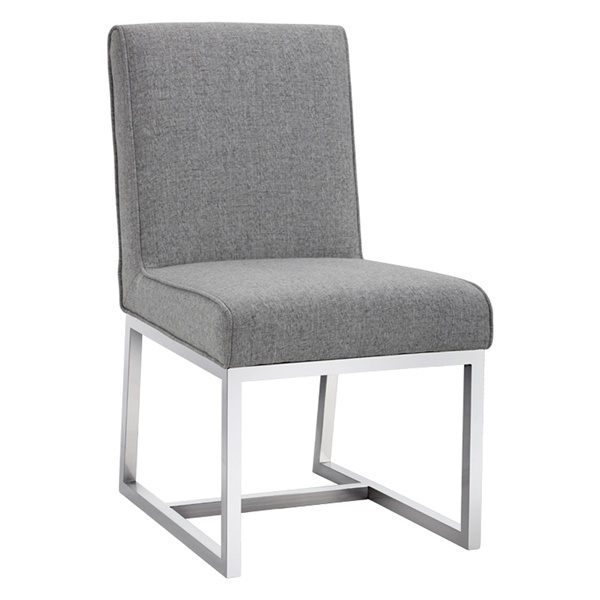 Clean lines make the chair a superb choice to complement the décor in a modern setting. Sold in multiple glamorous colors.